What would it be like to live in a world at peace according to Nobel Peace Prize winners? With the title “to achieve world peace” the last session of the World Summit of Nobel Peace Laureates took place in Barcelona. Panellists were asked how they could imagine their country in peace. Former President Oscar Arias from Costa Rica replied that peace is a daily situation in his country; it’s part of the country’s nature, part of its genetics, as it is a country without an army and conflicts are resolved through dialogue and reaching agreements. He said that the meeting of different governments on the subject of Syria has taken place too late and that the meeting should have taken place earlier. Former South African President, F. W. De Klerk explained that in order to resolve violence in South Africa under apartheid, first they had to achieve peace and then keep it. The other great challenge was to reduce the gap between rich and poor. Professor Jody Williams said that for her country, the United States, in order to build a positive peace instead of fomenting violence, first they have to dismantle the myth that the majority of Americans believe in: that the USA is a peaceful country. The people forget that the United States was born from a genocide of the indigenous population, Americans carry war in their genes, the history of the USA is full of war, but countries build their myths on stories that they are interested in in order to create identity. 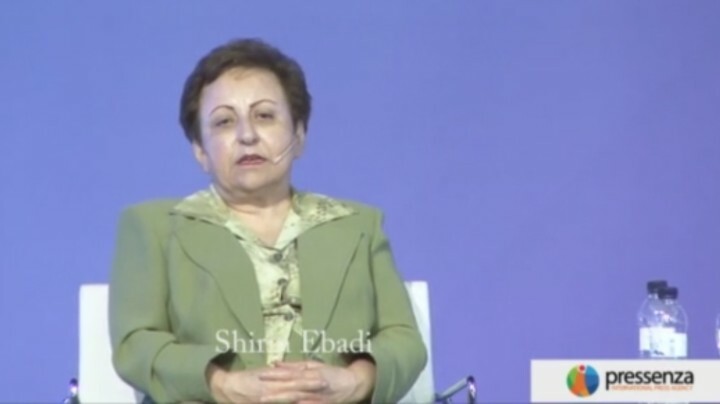 The Iranian doctor, Shirin Ebadi replied to the question regarding how Iran would be in peace. For her, democracy doesn’t mean only a victory in elections. She said that we shouldn’t imagine that because elections are freely held in a country and a political party comes to power, then this government is a democratic one. For Tawakkol Karman, Yemen is a peaceful nation that in 2011 decided to go to the street peacefully against the dictatorship. They went with flowers in their hands to confront the dictator, they lost their brothers in the struggle while they were singing. They didn’t attack anyone and achieved the resignation of the President.